Are you tired of slouching or hunching over at work or study? Are you feel pain of shoulder or back? Tomight Back Posture Corrector is the best choice for you! ✅ It works by pulling back your shoulders and straightening your upper back, reducing your back pain. Making it an effective upper back posture corrector. ✅The posture corrector is adjustable, and a universal size, so it perfectly fits chests from 20 inch to 50 inch in circumference! ✅The back brace is made with soft, breathable neoprene material that is very comfortable and invisible underneath your clothes, so you can look and feel amazing all day long! 1.Unpack the psoture corrector and place the velcro straps through it. 2.Slip arm through loopslike a backpack. 3.Place the posture corector over your shoulder and grabs both straps in your hand. 4.Tilt your shoulders back slightly and adjust the length of the staps to your dimension. Tomight Posture Brace cover 12 month warranty, if you have any issue about this product, please feel free to contact us. LONG-TERM POSTURE CORRECT: Tomight back posture correctorr for women & men promotes long term muscle memory, you will still stand straight up without slouching even though the item removed. 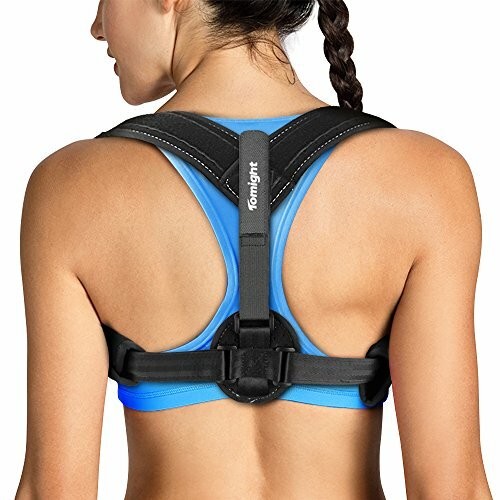 RELIEF BACK & SHOULDER PAIN: Wearing this posture brace, your shoulders and upper back are alighing for optimal posture and minimum backaches and it will reduce back and shoulder pain. ALL DAY COMFORT: The comfortable Tomight clavicle posture brace comes with 2 detachable armpit pads and provides all day wearability to avoid the posture corrector hurt your skin and make you uncomfortable. ONE SIZE FIT ALL: The back straightener is adjustable for chest circumferences between 25 and 50 inches. You can easily get it on and off the posture back brace by yourself without help. INVISIBLE UNDER CLOTHES:The Posture Support is designed discreet enough to wear under your shirt or blouse. You will not feel self conscious about wearing a posture brace band. If you have any questions about this product by Tomight, contact us by completing and submitting the form below. If you are looking for a specif part number, please include it with your message.